In passing, researching "To Be or Not To Be, That is the Question: Yhwh and Ea, by Anne Marie Kitz, in Vol. 80 Issue 2 - Apr 2018, Catholic Biblical Quarterly. I can imagine the earliest experience of water. It must have seemed that one was drinking God, washing with God, cooking with God, immersing in God. Aristotle defined wisdom as knowledge of certain principles and causes (Metaph. 982 a2-3). He commenced his investigation of the wisdom of the philosophers who preceded him, with Thales, the first philosopher, and described Thales as the founder of natural philosophy (Metaph. 983 b21-22). He recorded: 'Thales says that it is water'. 'it' is the nature, the archê, the originating principle. For Thales, this nature was a single material substance, water. Despite the more advanced terminology which Aristotle and Plato had created, Aristotle recorded the doctrines of Thales in terms which were available to Thales in the sixth century B.C.E., Aristotle made a definite statement, and presented it with confidence. It was only when Aristotle attempted to provide the reasons for the opinions that Thales held, and for the theories that he proposed, that he sometimes displayed caution. Walking with leashed Rokpa in City of Rockland yesterday, melting sand and snow brown puddles at edge of every corner, waiting for new tires to be mounted, I am splashed by passing car with the essence of things on black coat and space grey trousers because that's just the way of things. The white dog asks why, when there are several hundreds of acres of mountain out behind our house, we are walking the edges of snow and ice and melting mix of sand and salt on city streets, rushing cars uninterested in us after the undulation of temperature following several inches of wet storm the day before. The various faces of water. The sniggering sound of God. Reading 300+ pages of submitted papers. We trust always in the kindness of Our Blessed Lady. She lets all the mercy that Jesus is come to us. 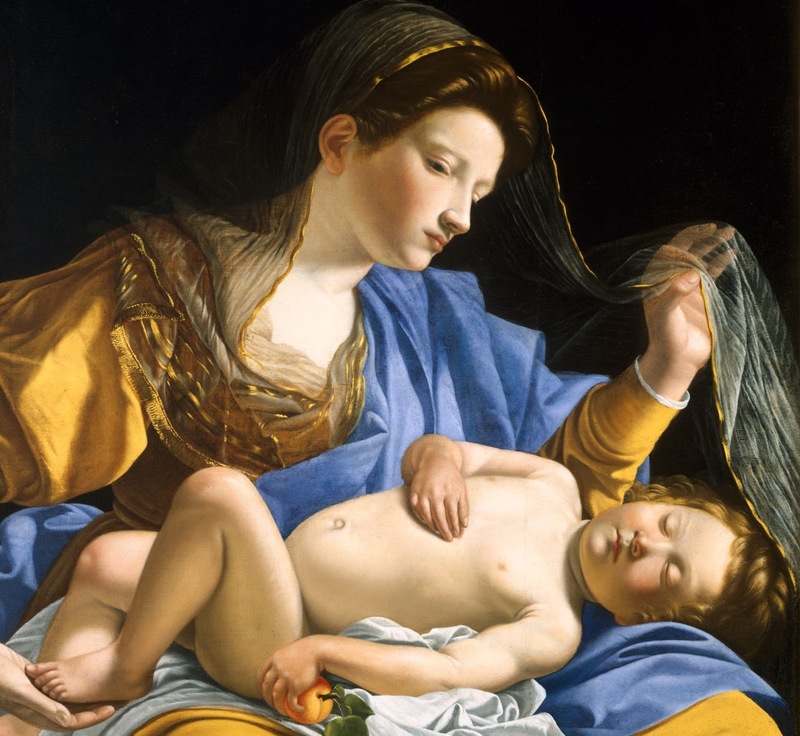 Orazio Gentileschi, Madonna with Sleeping Christ Child, Harvard Art Museums/Fogg Museum. Lines from our Cistercian father, Amadeus of Lausanne. 2019 will be a troubling, divisive, fateful year. 2019 will be a loving, kind, compassionate year. See what poet Charles Olson said about this in his poem Love. Then what a sermon in a Unity-Unitarian church said. Perhaps we are only as intelligent as the situation presenting itself with its intelligence to our awareness comes to be perceived, embraced, and embodied. The zen monk cycling across Canada, the US, and Central America told us that his koan throughout was "What is this?" "This" is what truth and reality is in zen awareness. It is what Christ was born for. Or, as another hymn says, "This, this, is Christ the King". To hew the sticks he finds. Trail two brows of snow. The hour when everything is at ready. When prayer seems silent necessity. And we are invited to listen as night confesses it's true allegiance.